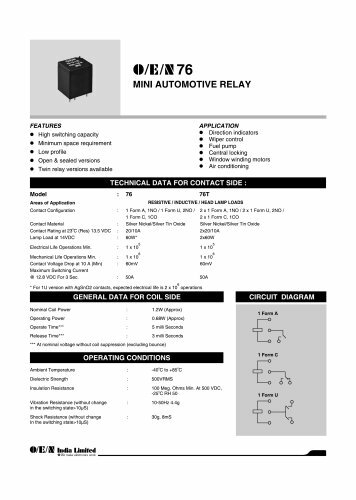 o/e/m 76 MINI AUTOMOTIVE RELAY FEATURES APPLICATION High switching capacity Օ Direction indicators Wiper control Օ Fuel pump Minimum space requirement Օ Low profile Central locking Օ Open & sealed versions Window winding motors Օ Twin relay versions available Air conditioning TECHNICAL DATA FOR CONTACT SIDE : Model Areas of Application Contact Configuration Contact Material Contact Rating at 23°C (Res) 13.5 VDC LampLoadat14VDC Electrical Life Opթrations Min. Mechanical Life Oprations Min. Contact Voltage Drop at 10 A (Min) Maximum Switching Current @ 12.8 VDC For 3 Sec. 76 76T RESISTIVE / INDUCTIVE / HEAD LAMP LOADS 1 FormA,1NO/1 FormU,2NO/ 2x1 Form A, 1 NO/2x 1 FormU,2NO/ 1 Form C, 1CO Silver Nickel/Silver Tin Oxide 20/10A 60W* 2x1 Form C, 1CO Silver Nickel/Silver Tin Oxide 2x20/10A 2x60W 1 x10 6 1 X10 60mV 50A 1 x10 6 1 X10 60mV 50A * For 1U version with AgSn02 contacts, expected electrical life is 2 x 10 oprations GENERAL DATA FOR COIL SIDE CIRCUIT DIAGRAM Nominal Coil Power Operating Power Operate Time*** Release Time*** 1.2W(Approx) 0.68W (Approx) 5 milli Seconds 3 milli Seconds 1 Form A O ' At nominal voltage without coil suppression (excluding bounce) 1 Form C O OPERATING CONDITIONS Ambient Temp驩rature Dielectric Strength Insulation Rsistance -40°C to +85°C 500VRMS 100 Meg. Ohms Min. At 500 VDC, -25°C RH 50 10-50Hz 4.4g 30g, 8mS 1 Form U -O Vibration Rsistance (without change in the switching state>10uS) Shock R驩sistance (without change In the switching state>10uS) Imlin Limitai 4e We make electronics work .